Here are two more of the beautiful pages of the B-E-L-I-E-V-E Chipboard Album. I hope you are enjoying all the pages of the album featuring the new DECK THE HALLS designer series paper and BELLS AND BOUGHS stamp set....which is one of the HOLIDAY BUNDLES ON SALE NOW!!!! If you purchase them as a Bundle you save 20%!!! Click to shop now! 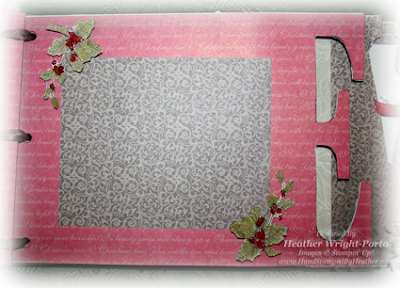 This page is the back of the "I" and is covered with the script pattern of the DECK THE HALLS designer series paper pack. You also see the knotted ribbon (Very Vanilla Seam Binding Ribbon) shown on the opposite side (previous post). The picture mats are separated by a piece of Tinsel Ribbon and decorated poinsettias. The poinsettias were stamped in Early Espresso on Sahara Sand scrap. Then colored with Cherry Cobbler and Old Olive Classic Ink pads using a Blender Pen. 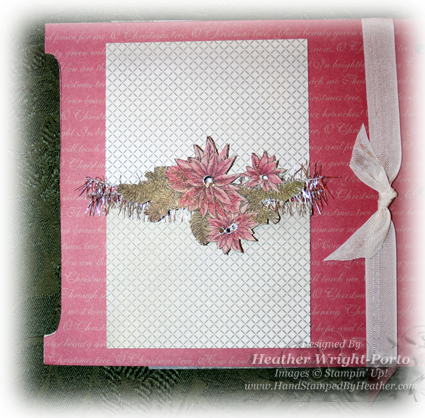 Then the Bravo Burgundy and Always Artichoke Stampin' Write Markers were used to highlight the lines in each leaf and poinsettia. When finished coloring, Basic Rhinestone Jewels were added to the center of the poinsettias. The picture mats are 2 x 3-1/2, basically to feature two wallet sized, landscape photos. The front of the "E" shown here again features the same DSP but this time with a brown mat (piece of 5 x 4 piece of designer series paper). It is accented by two sets of hollies. Each holly was stamped in Early Espresso on Sahara Sand paper. The the leave were outlined in an Always Artichoke Stampin' Write marker. Then colored with Old Olive and Cherry Cobbler Classic Ink Pads using a Blender Pen. Crystal Effects was then added to all the berries to give it a raised, deep, rich cherry look! Two more pages to be featured in two more days....enjoy!!! These are beautiful. Thank you for sharing the details.